It is vitally important that your rabbit sees a rabbit savvy vet if they become ill or injured. Normal veterinary surgeons receive a small amount of training on diagnosing and treating rabbits despite them being Britain's third most popular pet. Exotics vets have undertaken further training which enables them to properly diagnose and treat rabbits, ideally your rabbit should be treated by an exotics vet. Doing these daily checks on your bunnies can ensure any potential problems are picked up early and avoid hefty vets bills if they're picked up further down the line! It also gives you good bonding time with your bunnies. It's important that when you're handling your bunnies that you are confident and firm (whilst being gentle of course!). If rabbits sense your nervous going in to try and pick them up or check them over, they'll likely try and run away or kick out. Remember - if you notice anything unusual, call your vet! Regularly looking over your rabbit's ears, eyes and nose when grooming or giving nose rubs is essential to spot any potential problems early (and therefore easier and cheaper to treat at the vet!). Eyes, ears and nose are all quite closely linked in that little skull so a problem with one could be caused by, or lead to a problem with, one of the other. Dental problems can cause problems in all of the above too! The eyes are the easiest to check without getting physical with a rabbit, handy for rabbits who are a little hand shy! They should be bright and clear of discharge. There should be no sign of redness, no discharge, no cloudiness and no swellings or lumps and bumps. If you look at the bunny either head on or from the top, they should be even with no obvious bulging outwards. Some of the problems we see with eyes include blocked tear ducts, scratches and abscesses. Molar dental problems can trigger eye problems, so if you see a weepy eye, go to the vet and make sure they check for molar spurs too! Elongated molar roots have been a problem with some of our rabbits such as Rocket (see the teeth section below), this caused his eye to bulge overnight as he had developed an abscess in the eye socket. So when you have eye problems in a rabbit, be suspicious of teeth too! If you notice clouding or strange markings in the eye, rabbits can develop cataracts and glaucoma and can also get scratches on those big eyes really easy. The parasite, EC, can also trigger eye problems. A rabbit with eyesight problems may "scan" - this is when they move their head side to side slowly. This is most common in red eyed rabbits. A good vet will be able to check their eyesight for you. Rabbits naturally don't have great eyesight and blind or partially-sighted bunnies are common. They can do very well so long as they are given plenty of time to learn their surroundings or have a "guide bunny" companion. If you have a rabbit who spooks and lunges when you put your hand in front of them, they may be partially sighted and can only see shadows. If you notice any oddness with the eyes - straight to the vet! Kiwi - our bun with missing ears! The best bit of a bunny! When giving nose rubs, it's always a good idea to pick up each ear and have a look inside the canal, it should be clean without any smell or sign of dirt. Any dirt or smell could be ear mites. The outside of the ear should also be clean, it is usually thin on the fur front but there should be no dry skin or complete baldness. Use your fingers to rub round the base of the ears - many rabbits love a good ear rub - if you do both ears at the same time you can compare. Any lumps around this area can indicate ear abscesses which need urgent vet attention. Ear abscesses are most common in Lop rabbits, so if you have Lops, make this part of your daily routine! Head tilt, when a rabbit's head is stuck over on one side, can be caused by ear infections (as well as the EC parasite). If your rabbit has head tilt, this needs immediate vet attention and investigation. Rabbits can also get tears or holes in the ears either by catching it on something or from fights with other rabbits. These injuries do need vet attention and the rabbit will need anti-biotics. In extreme cases, parts of the ear may need removing. It's also known that some mother rabbits can "over clean" their newborn babies and, as a result, the rabbit loses one or both ears! Deaf rabbits are not uncommon. A deaf bunny may spook more often, especially when they're sleeping. They can hide their deafness well using other senses though. If you suspect your rabbit may be deaf, have a chat with your vet. If you notice your bun snuffling and sneezing with discharge, straight to the vet. A good vet will do a deep nasal swab (which isn't nice to see be done, be warned!) to identify exactly what bacteria is causing the problem. The rabbit is most likely to be put on Baytril. If Baytril has no effect, talk with your vet about other antibacterial medication. Upper respiratory problems ARE contagious, so if you have a pair living together, there is a chance it will be passed on to the other rabbit. Both may need to be tested. As for that wiggle, it's not them breathing as it doesn't need to wiggle to breath, but a way of getting scents into their nose faster and a form of body language. A very slow wiggle means a very relaxed bunny, the wiggle rate increases if there's something really interesting going on! Rabbits have a very good sense of smell. Dental problems are a very common problem we see in rabbits, so best for you to monitor as best you can. The only teeth you can see are obviously the front teeth. The molars are only visible with a scope, so these should be checked every time you visit your vet for routine MOTs or vaccinations. There are still checks you can do though! Look at the front teeth when they're eating. They should be clean, creamy white and should never look long or over grown. There should never be any sign of dribbling. Over grown incisors are most commonly a sign of dental misalignment (malocclusion). Rabbits with chronically misaligned incisors will need regular filing down (never clip them!) and it may be worth talking to your vet about removing the incisors. They do very well without incisors, we have several rabbits without. They will need their veggies grated but they can still eat hay as normal. To find out how misaligned the teeth are, your rabbit will need a head x-ray. This will also show if the misalignment extends to the molars. Molar spurs are frustratingly common. In rabbits with normal dental alignment, they can still get spurs, usually down to diet problems. This is why we talk about HAY HAY HAY! Watch the way your rabbit chews long strands of hay. Their jaw moves in a circular motion and its this action when eating hay that wears the molars evenly. You don't get the same wear from veggies or pellet type foods. There is just no replacement for long strands of hay! You can check some of this just by getting down on the floor and watching your bun hop around. They should not be any lameness - that could indicate a sprain or break. If they are holding up a paw or moving awkwardly, this needs immediate vet attention. We have fixed breaks and had rabbits needing limb amputation. They have very fragile bones. The picture above shows a rabbit we took in with overgrown claws. Claws like this can cause the rabbit to move awkwardly - leading to secondary problems. They may also scratch themselves when grooming. In some cases they can even break their toes getting those long claws caught. You should only ever be able to see the very tip of the claw poking out from the foot fur when the rabbit is sitting normally. Clip claws very carefully with a proper animal clippers, never human nail clippers. Be careful not to catch the quick, the blood supply that runs to the nail. Only clip the tips and slowly work your way down. It's easy to see the quick as a pink line in white claws, but impossible in dark claws. If you're not confident, your vet can help you do this. If you do nip the quick, use Styptic Powder or plain flour to stop the bleeding. It's good practice to monitor your rabbit's weight and body condition regularly, you can do this just by stroking. If you're able, weekly weighing can help indicate any problems as their weight should be steady. Any sudden weight loss or weight gain needs vet investigation. If you want to work out whether your rabbit is under or over weight, have a look at this website as it has some good pictures http://www.therabbithouse.com/diet/rabbit-weight.asp. Rabbits moult regularly and the heaviest of those comes in spring when they blow their winter coat. Yes, even Rexes moult. This is normal. What is not normal is any bald patches or dandruff as this can indicate fur mites and we recommend a vet visit and an injection to rid a bun of these. There are other causes of bald patches and rough skin, including fights with other rabbits, internal organ problems and infections, which is why a vet visit is recommended. Checking your bunny's bum is important to make sure they are managing to keep it clean and are free from problems including flystrike or urine scald. You can have a quick look when they're hopping around, even if you do look a little mad lying on the floor trying to peer under their tail! Or you can carefully hold them on your lap with their bum up to have a look, much like the picture at the top of this page. A healthy rabbit's bottom should be pristine and clean. There shouldn't be lots of poo there at all. Some rabbits can be lazy about cleaning their bum, or if they are overweight or have mobility problems they will also have problems cleaning. To clean there you can use baby wipes or some warm water with cotton wool. We do not recommend bathing unless it's extreme, in which case you should also visit a vet to find out the cause. Rabbits should never get a full dunking but in extreme cases where rabbits have chronic problems cleaning, they can be sat in a shallow tub of warm water for a short while to loosen hard poo stuck to the fur. Checking the droppings of your rabbit is a fab way to make sure their gut is healthy. 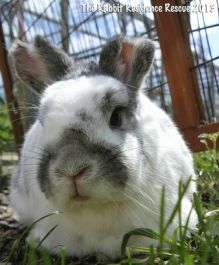 There's some great pictures on this website by Save a Fluff http://www.saveafluff.co.uk/rabbit-info/rabbit-poo. It's normal for rabbits to do LOTS of poo, they can do over 300 poos a day! If you notice a dramatic decrease in poo output or a change in size, you must go to the vet! Small poos can be an early sign of gut stasis or sloppy poos with mucus can be a sign of infections like enteritis. For more details on gut function, have a read of this by the RWAF http://rabbitwelfare.co.uk/pdfs/ROWinter10p7.pdf. The Rabbit Welfare Association run a yearly conference, a fantastic way to get access to the most up to date information an caring for your rabbit!